I have Jessica Jones issues, hang-ups not actual comic books. It seems like every time I read her in a story she is yelling the same refrain, “What about the baby!” Now I do agree as a parent that Mr. Cage should be sharing in this mission statement and getting a little more serious about his fatherhood. But it has often felt too repetitive. With Ms. Jones making a future Netflix debut, I reluctantly stuck my toe into Jessica Jones: The Pulse The Complete Collection. Jessica Jones, former superhero, has worries. She is pregnant with her boyfriend Luke Cage’s baby. Jessica has to be responsible and get insurance! J. Jonah Jameson hires the former heroine to write a pro-superhero column “The Pulse” for The Daily Bugle. She partners with former journalistic great Ben Urich who also needs a second chance. Jessica’s turn in the press will take her up against Norman Osborne, Nick Fury (in a Secret War tie-in), and parenting. Urich’s quest for a good true story leads him to D-Man, a washed up D (maybe G) level hero in need of a break. Will Jones be able to successfully navigate parenting, relationships and the daily working grind. 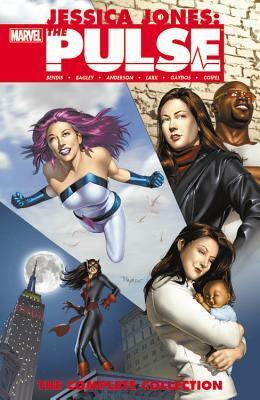 I loved Jessica Jones: The Pulse The Complete Collection. I really thought I would dread it. But is it was really an interesting collection. Jones is concerned about her future and future child. But she is taking charge of her life to protect her future and her man. It is not always easy. In the midst of Secret War, an injured Cage disappears. Jones searches the city trying to find the father of her child. But no one makes it easy. As Danny Rand defends his near brother, Iron Fist hides him first and foremost from Jones who despite carrying Cage’s baby is a new variable to Fist. The Night Nurse is a safe place for Cage, but Jones is not! It is heartbreaking as one watches Jones holding her family together and getting attacked by those who should welcome her most. S.H.I.E.L.D. has a huge influence in this story. And in many ways it is Jones vs. Fury as she attempts to discover what Cage got himself wrapped up in. She is really a low-level reporter former superhero going up against the most powerful man in the world. It feels like a losing battle. But there are some within S.H.I.E.L.D. who want to see Fury exposed and knocked off of his pedestal. Urich and Jones are at the heart of the action. Though Jones for her part is offered a job with Hydra, they have a great benefits package! All she has to do is the right thing and help take down that evil Nick Fury. When I think about Netflix, I am thrilled that Luke Cage is going to appear in all 13 episodes. It is interesting watching on the page these two navigate their relationship. They are heroes, but without masks. They are also both fiercely independent and it will be interesting to watch these two strong willed personalities attempt to match-up on the screen. But what I really want to see, and will not is seems, is Urich and Jones together. I like Vondie Curtis-Hall as Urich on Daredevil. And I would like the idea of a partnership between the experienced Urich and the fresh Jones…and both needing a second chance of some type. It would have been a nice subplot in the story. But Jones will be a private investigator not a reporter so it may not make strong story sense. It would be great, maybe in a future version, to see the Urich and D-Man storyline. It has huge tie-ins to Daredevil and it really could explore the cost of being a vigilante. Brian Michael Bendis wrote this volume and created Jones. I have generally liked most of Bendis’ writings so I do not know why I was so hesitant on this volume. It is really well written and has plenty of fighty fighty. But it is really the characters and relationships, which move this story to a satisfying arc. Perhaps, Jones is best when written by Bendis and maybe other authors do not understand how to use her well. I really enjoyed Jessica Jones: The Pulse The Complete Collection. I think for the first time I get who Jessica Jones is. She’s a tough spirited hero who cares deeply for those she loves! And now I can say I am very very excited for A.K.A. Jessica Jones.